Kick back, relax and enjoy your summer, even if you have home improvement plans built into your calendar. While making your home your own can be rewarding, it can be expensive to undertake a large project, like installing a deck or sunroom on your own. What’s more, if you don’t know exactly what you’re doing, you’ll waste time and incur additional costs by ripping everything down and starting from scratch. Don’t let your dream home improvement project literally collapse around you –– hire the Durham, NC home design experts at Gerald Jones Company to help. Custom-designed sunroom. If you want to enjoy unfiltered light and a picturesque backyard without actually going outside, consider installing a sunroom. Our Durham sunrooms are great spaces to read a book or entertain guests, no matter the weather. Entry and storm doors. Revive the look of your home with a new front door. Ours are available in a variety of colors and textures, such as steel, wood and fiberglass. Decks. 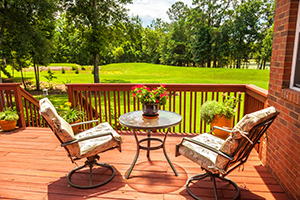 Pull up a chair and sit a while on your brand new deck! With more than 60 years of experience in the home improvement industry, and free deck consultations, there’s no reason to not extend your home with this outdoor living solution. Screened porches. Feel like you’re sitting outside, but without invading mosquitoes and ants, with a screened porch from Gerald Jones. These customizable outdoor rooms let you feel cool breezes without the hassle of sitting directly outside. Put down the hammer and kick your feet up –– we’ll take care of the rest. Call Gerald Jones Company today at 919.286.1700 to schedule your free consultation, or to ask any questions you have about what we can do with your additional summer home improvement projects. This entry was written by geraldjones, posted on May 3, 2015 at 4:13 pm, filed under Uncategorized. Bookmark the permalink. Follow any comments here with the RSS feed for this post. Both comments and trackbacks are currently closed.